Accommodation The accommodation is fitted throughout with teak joinery to a very high standard and offers four berths in two cabins. The forward cabin contains two large single berths in a V configuration with drawers under for clothing. Outboard under the side decks are full length shelves with cave lockers under each berth. Set into the forward bulkhead is an access door to the chain locker. Side and forward windows let in plenty of natural light and there is a deck hatch forward of the door. In the port aft corner is a washbasin and dressing table with further drawers and stowage, while on the starboard side is the en-suite heads with Lavac WC, night lights and ventilator. There is a holding tank with diverter valve. The cabin has teak and holly soleboards with blue loose fitted carpet over, blue curtains and oatmeal berth covers. Reading lights over each berth. Aft into the saloon with half round settee in blue marine leather to port with a teak drop leaf table in front facing the galley opposite. Cave lockers are located outboard beneath and behind the settee with bookshelves above. Reading lights and main saloon lights over. The spacious U shaped galley has a stainless steel sink with H&C mixer tap, a two burner gas cooker with new oven and grill, new refrigerator and large lockers under the main unit for food and other items. Crockery is kept in purpose built racks outboard under the side deck. Below the generous worktops is further cupboard and drawer stowage. The large extractor fan above the cooker can be reversed to draw air in. There is a drinks locker also accessible from the wheelhouse. Soleboards are teak and holly with blue curtains. Three steps lead aft up into the wheelhouse. The helm position is to port where there is an adjustable helm seat in front of comprehensive engine instrument display, chartplotter and with other navigation and mechanical aids grouped around and above it. A three part windscreen and deep side and rear windows ensure excellent all round visibility, with a door port and starboard to the side decks. A matching navigator's seat is to starboard complete with night light, chart area and chart locker. A drinks locker, accessible from the galley also is underneath. A forward facing two seat settee runs across the port rear of the wheelhouse and this has a spacious locker under and a bookshelf behind. In the starboard aft corner is the comprehensive switchpanel with Mimic display. Steps lead down to the aft cabin and this can be closed off completely by way of a raising/lowering hatch and folding doors. 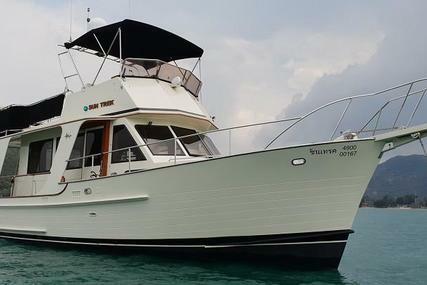 The engine bay is located beneath the wheelhouse and is easily accessed by lifting either port, starboard or both heavily insulated teak and holly soleboard hatches. There is plenty of room below for daily level checks and for major servicing. 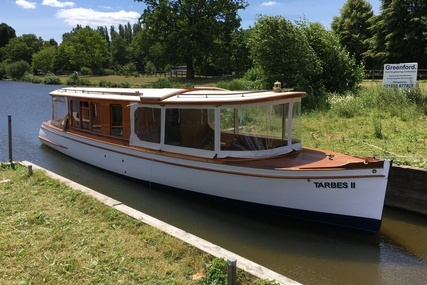 Steps lead down from the wheelhouse to the aft cabin where there are two large berths, with reading lights at either end, separated by an elegant teak dressing table with mirror, drawers and additional chart stowage. There is an opening hatch to the aft deck. In the forward starboard corner is a large hanging locker and shelving. Under the stairs are two drawers while in the forward port corner is the en-suite heads, with Lavac WC, washbasin, various cupboards and shower. Soleboards are teak and holly with blue carpet over, berths have oatmeal covers and the curtains are a mid blue. Central heating throughout. The side decks are exceptionally wide, laid with teak and surrounded by guardrails. The foredeck is spacious, has deep bulwarks with a stainless steel pulpit rail. The aft cabin roof is also laid with teak and has a substantial hand rail and spray dodgers - an ideal sunbathing area. A gate in the stern rail gives access to the bathing platform and boarding ladder. Mechanical Systems Located beneath the wheelhouse, twin Ford Lehman 225hp six cylinder turbocharged diesel engines with Elasto mufflers. Electric start. Freshwater cooled via heat exchangers. Shaft drive to fixed pitch three bladed propellers via Newage PRM hydraulic gearboxes. Ambassador shaft fitted rope cutters. Single lever Morse Supreme controls. 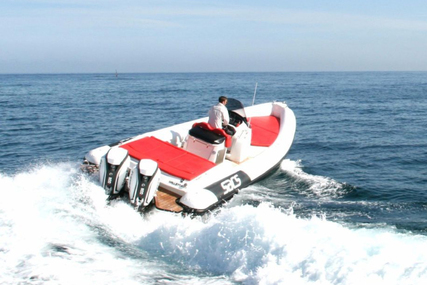 1180 litre fuel capacity giving approximately 400 miles range at 12 knots cruising speed. Maximum speed 18 knots. The engines and turbos have been completely overhauled and rebuilt as required, all hoses replaced, fuel tanks purged and lines cleaned, shafts and propellers removed and checked, engine block heaters fitted to improve starting and reduce emissions. Exhaust alarms fitted. The engines have only completed around 1000 hours running time. Vetus bowthruster. Pneumatic tank monitoring system. The engines were last serviced April 2019. Electrical Systems 6 x 12 volt batteries (new 2015) Alternator charging 240 volt shorepower system Galvanic isolator Inverter Immersion heater Battery charger Deck Equipment 35lb CQR anchor with 30m stainless steel chain & warp Vetus Napoleon electric anchor windlass with helm control Stainless steel pulpit, pushpit and guardrails, gates port, starboard and aft Stainless steel fender racks fore and aft Stainless steel coachroof grabrails Canvas covers to wheelhouse windows Spray dodgers to aft deck S/S liferaft bracket and outboard pad Bespoke bathing platform with stainless steel ladder Various fenders and warps Winter storage cradle Navigation Equipment Sestrel steering compass RaymarineST60+ windspeed & direction, depth, boatspeed & log Raymarine ST60+ compass and multi repeater Raymarine ST6001 autopilot Raymarine C120 with chartplotter, radar and AIS Furuno NX300 Navtex SeaMe radar target enhancer Raymarine 240E VHF radio Raymarine loud hailer Hear Me programmable sound warning system Clock and barometer LED navigation lights(2015) Heavy duty pantograph windscreen wipers Automatic solar vents to wheelhouse and fore and aft cabins Screen demister Glomex TV antenna Kenwood radio/CD player Safety Equipment Two horseshoe lifebuoys Two fire extinguishers, one auto extinguisher in engine bay Six man liferaft EchoMax radar reflector Double horn Gas alarm in engine bay and solenoid Manual bilge pump and three automatic electric bilge pumps Francis searchlight with internal control, aft deck floodlight Construction A unique Nicholson 36ft four berth motor yacht designed for extended cruising in comfort, SINDUR IV was especially constructed for a client on his retirement from sailing and was the last Ranger to be built. Extensively refitted by Suffolk Yacht Harbour during 2006/7 and further refitted in 2015 she is now of a higher standard than when first commissioned. 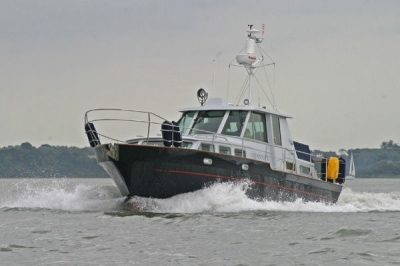 The work completed includes: Engines and stern gear have been completely overhauled and rebuilt as required; the hull has been epoxied below the waterline and topsides and superstructure resprayed in Midnight Blue and Whisper Grey Awlgrip; bowthruster fitted; teak decks refurbished; guard rails improved; a bathing platform installed; comprehensive navionics system fitted; electrics rewired; interior has been refurbished with new windows and hatches; new uphlostery; central heating fitted; new galley equipment and much more. Comments A truly stunning example of these classic motor cruisers. 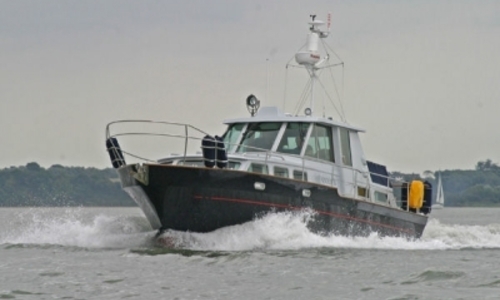 Built by Camper & Nicholson to a very high standard, the Ranger hull has a proven track record of build quality, excellent sea keeping, spacious interior and long range cruising capacity. Following an extensive refit in 2006/7 by Suffolk Yacht Harbour and again in 2015 by Harbour Marine Services, Southwold, she is now in quite excellent condition and ready to go for this season. 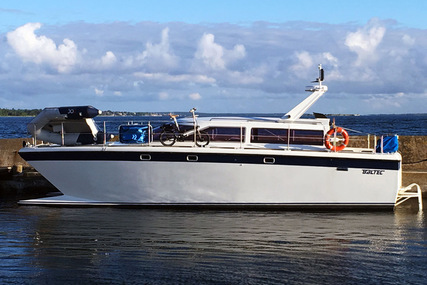 A rare chance to own a beautiful vessel which attracts admiring looks wherever she goes.